MARINA DEL REY, CA--(Marketwire - February 10, 2011) - Whether you're looking for love, or you've already found it, let your heart grow fonder in Marina del Rey, just minutes from Santa Monica and Venice Beach. Beautiful harbor views and endless activities come together for the perfect place for you and your loved ones to enjoy the best life has to offer. At www.TodayMarinadelRey.com, you are one step closer to finding the vibrant Southern California lifestyle you deserve with a variety of properties for everyone's needs and wants. 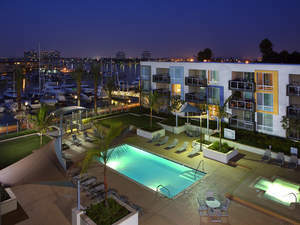 Providing the complete waterside life for work and play, from waterfront apartments and on-site boat slips to concierge service and other first-rate amenities right at home, the E&S Ring family of properties includes Bar Harbor Apartments, Esprit Marina del Rey, Mariners Village, The Tides and Waters Edge, and The Villa Apartments. Each apartment community offers a variety of indoor and outdoor activities, and is designed for easy access to water sports, on-site fitness centers, heated pools, spas and saunas, to list a few. At Mariners Village, residents indulge in an appealing 24-hour fitness center outfitted with state-of-the-art Paramount Fitness equipment and rejuvenating saunas. Or, test your limits with a free fitness boot camp Monday evenings at Esprit Marina del Rey, and find your inner balance with free yoga every Saturday. Tucked along the Pacific coastline, Marina del Rey offers its residents superior customer service and resort-caliber amenities. Amid lush landscaping and serene seascapes, residents are steps away from retail shops, restaurants and the energetic Los Angeles nightlife. Three of the five properties even provide coveted boat slips, offering unequaled on-water support and effortless marina channel access. A recreational Pacific coastal playground, Marina del Rey is a scenic retreat from city life while still centrally located near major corporate and office hubs, LAX and exceptional hotels, such as The Ritz-Carlton, Marina del Rey. With communities offering a range of leasing rates, you can choose the perfect place to call home.